Setting a certified diamond into an engagement ring is an intricate process that involves exact measurements and skilled craftsmanship. Extreme care must be taken to ensure that the engagement ring and the diamond remain intact and properly set. Unsurpassed quality is a priority at Brilliance; that’s why we have only master jewelers working to create our exquisite fine jewelry. George Melkonian is a master jeweler at the Brilliance.com headquarters. With over twenty years of experience in the field of fine jewelry, he has developed an eight-step procedure for setting a loose diamond in a solitaire engagement ring. Along with reading their descriptions, you can view George executing the eight steps in the images below. The jeweler opens the platinum prongs to the size of the diamond. 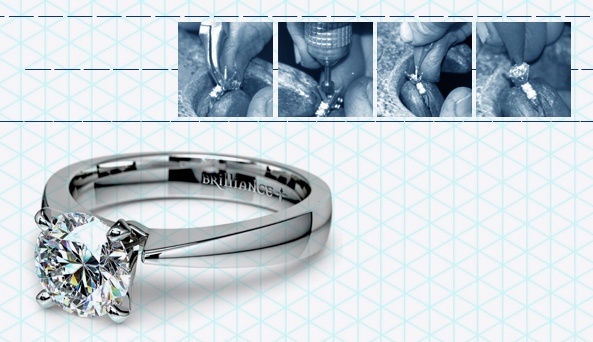 The further the prongs are opened, the lower the diamond will sit in the setting. After the prongs have been positioned to the size of the diamond, the jeweler cuts the prongs to the height of the diamond. To do this, he removes the top of the platinum prongs with fine jewelry clippers, leaving extra metal to secure the diamond. After the prongs are cut, a residue is left on them. The jeweler removes this residue using a flat engraving tool. The jeweler must position the loose diamond so that the star facets sit within the prongs and the proper facets remain between the prongs. Using a pusher tool, the jeweler bends the prongs over the diamond at a 45 degree angle, locking the diamond down in its setting. The jeweler smoothens the tips of the prongs using a specialized filer tool. To give the prongs a smooth and fine finish, the jeweler glides a spinning rubber wheel along the prongs. In the final step, the jeweler polishes the engagement ring setting to its exquisite mirror-like finish. He plates white metal pieces in rhodium to give a white, strong exterior coating.